Photon emission processes have corresponding absorption processes. We will mainly consider X-ray absorption. Take an astronomical source at distance L from the observer. The fraction of volume, dV, which h is blocked by the presence of element Z can also be thought of as the probability that a photon from the sourceis absorbed in volume dV. Integrating over length from source. Including all elements in the line of sight:. Where nH is the interstellar hydrogen number density, and NH is the number of H – atoms per m2. 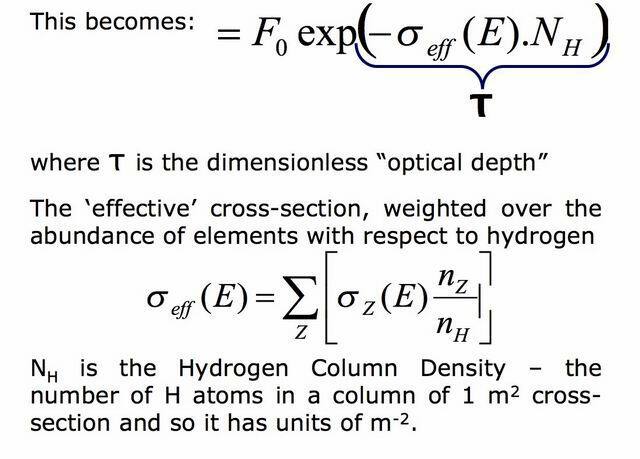 Column density is measured from the 21 cm atomic hydrogen line but there is a factor of 2 uncertainty due to e.g. wide beams. Also the contribution to the column from molecular hydrogen is unknown since it is much harder to measure; it is believed to follow the same distribution of atomic hydrogen. These derivations assume that the ratio of nZ to nH is constant along the path, while nH varies with distance from the observer. Photoionization leads to recombination of the removed electron, thus photoionization removes X-ray photons – also extreme UV photons – and dominates in these bands. The two forms of electron scattering, Thomson scattering and Compton scattering, remove photons from the line of sight. 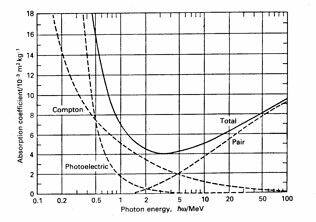 In Thomson scattering, the photon energy is much lower than the rest mass of the electron and is just deflected, while in Compton scattering, the photon effectively transfers some of its energy to the electron, thus light is absorbed. At very high energies, photons can collide with ambient photons and form an electron-positron pair, i.e. photon energy is lost and particles are formed. In the inverse process, electrons and positrons can annihilate each other, emitting gamma-rays. In synchrotron self-absorption, the photons produced by the spiralling of electrons in the magnetic field, are then absorbed by those same electrons. 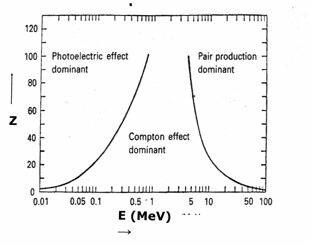 Photoelectric absorption is dominant at low energies and pair production at high energies (E > 2moc2) while the Compton effect is dominant at intermediate energies. Note that for Pair Production, the incoming photon can also interact with another photon in space to produce an e-/p+ pair (the interaction cross section is not very different from that with a nucleus). Absorber is lead – plots shift up and down in energy with Z increasing or decreasing. For Hydrogen (the most abundant absorber in the universe) Compton scattering becomes relevant above 10 keV. Absorption coefficients for the main processes in the X and γ ray band . Dependence of absorption processes on atomic number. An atom, ion or molecule absorbs a photon and releases an electron with an energy equivalent to the energy of the incoming photon less the ionization energy for the level that the electron occupied. The absorption cross-section is characterized by edges which correspond to the various ionization levels. The position of the edges in frequency space reveals which atom/ion/molecule is involved and the depth of the edge gives the amount of material in the line of sight. The fall in cross-section between the edges is approximately proportional to the inverse cube-root of the frequency. 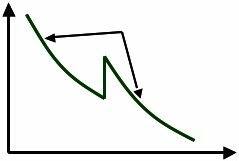 This trend can be explained by the requirement to preserve the total momentum of the photon+ion/electron system. Dependence of photoelectric absorption cross-section on energy. where EI is the electron binding energy, σ=e2/4Πeoħc is the fine structure constant and σT=8Πe3/3 is the Thomson cross-section. The effective photoelectric absorption cross-section, σeff, is plotted against wavelength in Å for the interstellar medium for an assumed set of interstellar element abundances. Note the ionization edges of the different elements. 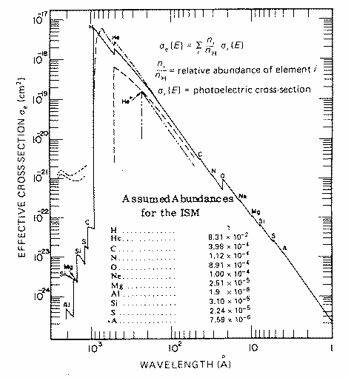 Photoelectric absorption cross-section in the interstellar medium. When the radiation from an astronomical source passes through the interstellar material its energy spectrum is distorted due to absorption. In general such material can be located anywhere between the source and the observer, i.e. can be surrounding the soucre (in which case we often talk about ‘intrinsic’ absorption, near the observer (as is the case for extragalactic sources where a large part of the absorbing material is located within our own galaxy), or elsewhere in between. The observed spectrum depends on the intrinsic one and the amount of absorption along the line of sight. In the example in the figure in next slide, a power-law spectrum (typical of many high energy sources) is absorbed mainly at low energies, as expected from the photoelectric absorption cross-section shown in the previous slides. Note the presence of edges, corresponding to the ionization thresholds of the interstellar material. Effect of photoelectric absorption cont. 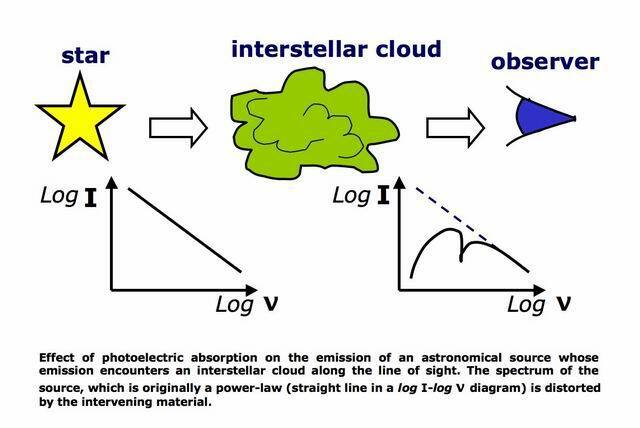 We will take the example of X-rays leaving a star and passing through an interstellar cloud, which is photoionized by the star’s X-rays, absorbing photons from out of the line of sight. If the star has a spectrum of the form shown on the left, the resultant spectrum will be absorbed as shown on the right.